When it comes to national defence duties, the Tatmadaw is an organization which wants least but sacrifices most. So, it has been standing tall with its own characteristics such as the twelve traditions of the Tatmadaw. 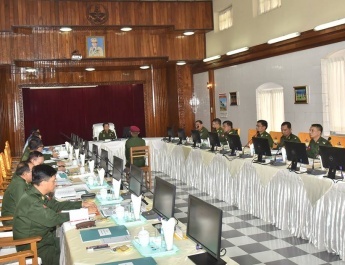 In shouldering State defence duties, the Tatmadaw has a long tradition of continuously turning out servicemen who have been working with perseverance, zeal and industriousness as well as at risk of their lives. Therefore, the Republic of the Union of Myanmar itself has been standing tall among the global community. 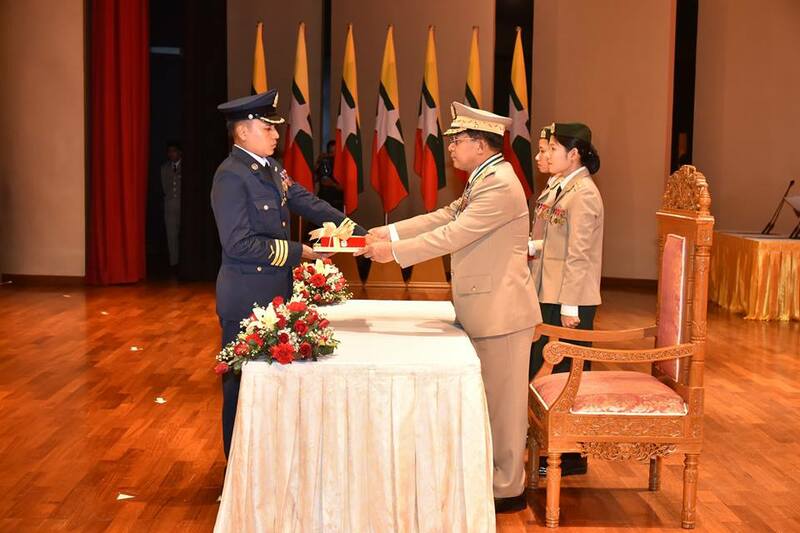 Every citizen has an inborn duty to protect the national sovereignty, the lives and property of the people and the national interest of the State, said Commander-in-Chief of Defence Services Senior General Maha Thray Sithu Min Aung Hlaing at a ceremony to present gallantry medals and certificates to officers, other ranks and inheritors held at Zeyathiri Beikman here this afternoon. Also present at the ceremony were Daw Kyu Kyu Hla, wife of the Senior General, Deputy Commander-in-Chief of Defence Services Commander-in-Chief (Army) Vice-Senior General Thiri Pyanchi Soe Win and wife, the Union Minister for Home Affairs and wife, the Union Minister for Defence and wife, the Union Minister for Border Affairs and wife, the Chief of the General Staff (Army, Navy and Air) and wife, the Commander-in-Chief (Navy) and wife, the Commander-in-Chief (Air) and wife, senior military officers of the Office of the Commander-in-Chief and their wives, the Nay Pyi Taw Command Commander, the medial recipient officers and other ranks and inheritors, and invited guests. In his honorary speech, the Senior General said it was a ceremony to present gallantry medals and certificates to those who shouldered national defence duties mostly diligently and courageously by risking their lives. The Tatmadaw was the most important national political force in the effort to regain independence. It is known to all that it is also the Tatmadaw which has been safeguarding the country’s independence and national sovereignty by daringly overcoming all threats and challenges throughout history. This is why such a ceremony is held annually on Independence Day. Since its inception, the Tatmadaw has been working hand in hand with the people and conceived patriotism, the noble spirit to sacrifice lives and blood in regaining and maintaining independence, which is the core treasure handed down by the ancestors. As a gesture of honouring the heroic martyrs who sacrificed their lives for the sake of independence and the people in successive eras, the Memorial to Fallen Heroes (Nay Pyi Taw) was opened on 27 March 2017 so that the posterity will remember and honour those martyrs. Safeguarding the State, the religion and the people with the valiant spirit by generously sacrificing life and limbs for the sake of the nation and the people is the noblest capability which is taken pride by every human and citizen. The Senior General said he specially took pride of all capable persons for their firm morality, brilliant courage, spirit of sacrifice, who discharged duties assigned by superiors to have accomplishment in missions without delay to make sacrifices of their lives and limbs with firm morality, brilliant courage, spirit of sacrifice and firm vows and honoured them. 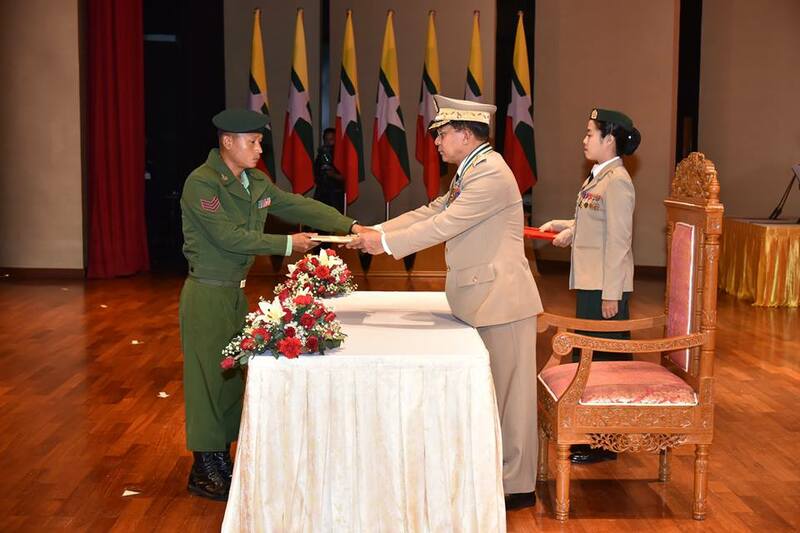 Then, the Senior General said at the ceremony held on 4 January 2017, Thiha Thura title was awarded to one person, Thura titles to 14, gallantry medals to 75, the gallantry certificates of the Commander-in-Chief of Defence Services to 222 and the honorary certificates of the Commander-in-Chief of Defence Services to 489. At the ceremony held at the Presidential Palace this morning, the President himself awarded Thura titles to five outstanding persons. And, gallantry medals would be awarded to 25 persons, the gallantry certificates of the Commander-in-Chief of Defence Services to two and the honorary certificates of the Commander-in-Chief of Defence Services to 13. 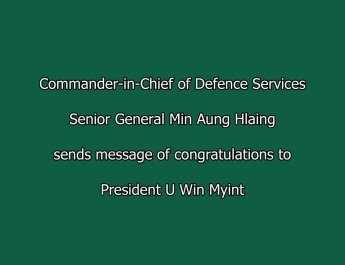 Moreover, commanders of respective military command headquarters, on behalf of the Commander-in-Chief of Defence Services, would give the gallantry certificates of the Commander-in-Chief of Defence Services to 61 persons and the honorary certificates of the Commander-in-Chief of Defence Services to 166 at the same time. Afterwards, the Senior General noted those who could set the noblest life records that they pledged to sacrifice lives in discharging State defence duty not to tarnish prestige and integrity of the lineage and prestige and fine traditions of the Tatmadaw are good symbols of prestige of national cause for all citizens and give good legacy to new generations for future defence prestige of the mother land. As such, new generations need to respect and emulate their brilliant capabilities. Hence, those who were awarded militarily honorary medals and certificates today have carried out their assignments and obligations with dynamic and sharpened tenacity, diligence and perseverance by upholding the noble concepts in discharging State defence duty to be able to set the complete and noble records. 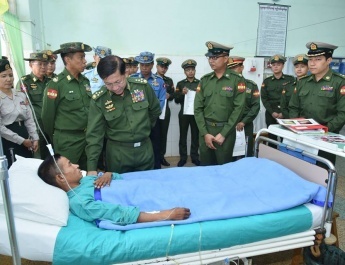 Therefore, the State and the Tatmadaw will remember and take pride of them as heroes of the people forever. Senior General Maha Thray Sithu Min Aung Hlaing presented gallantry medals to one Colonel, four Lieutenant-Colonels, two Majors, three Captains, two Corporals, one Lance Corporal, one Private and 11 inheritors, the gallantry certificates of the Commander-in-Chief of Defence Services to one Captain and one inheritor, and the honorary certificates of the Commander-in-Chief of Defence Services to one Lieutenant-Colonel, two Majors, one Captain, two Warrant Officers-II, two Sergeants, one Corporal, one Lance Corporal and three inheritors. 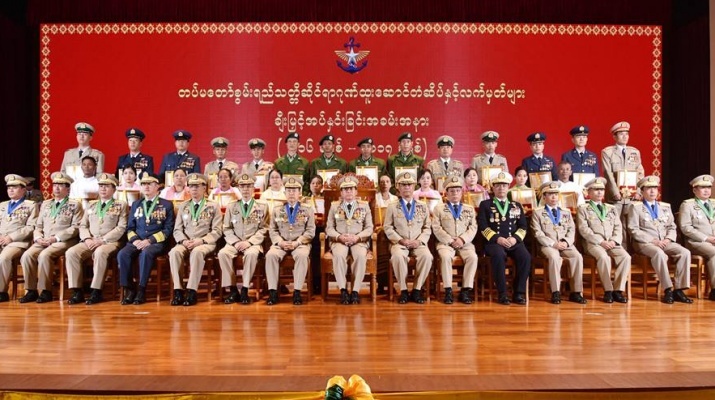 Then, the Senior General and party posed for documentary photo together with the officers, other ranks and inheritors who were awarded the militarily gallantry medals and certificates. After the ceremony, the Senior General and party hosted tea party to those who won the militarily gallantry medals and certificates. 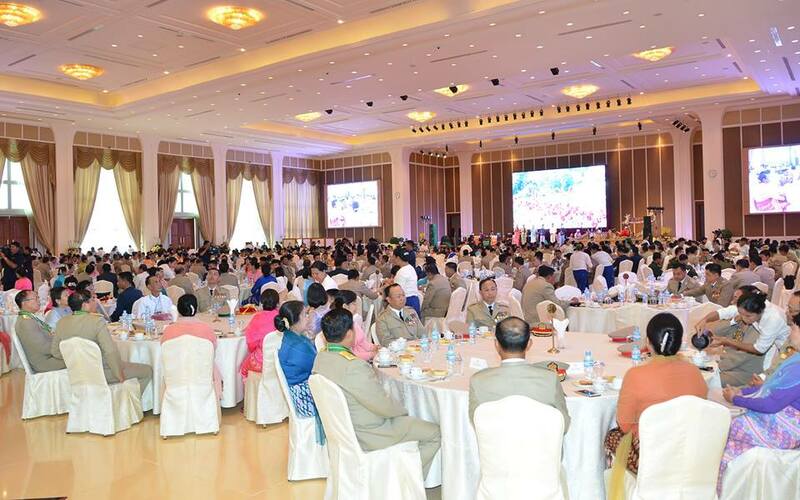 During the tea party, the Myawady Band under the Directorate of Public Relations and Psychological Warfare presented honorary songs. Then, the Senior General and party cordially greeted those present. 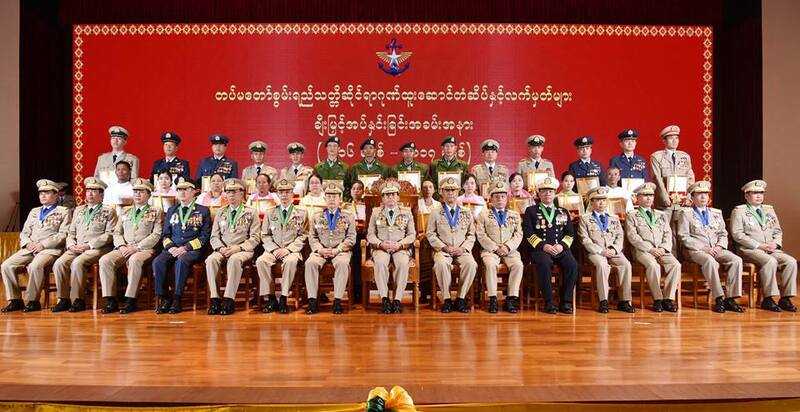 With regard to the winners of militarily gallantry medals and certificates, six outstanding winners were awarded Aung San Thuriya titles, 47 Thiha Thura titles, 547 Thura titles, six Thiha Bala medals, 1,862 gallantry records, 1,887 gallantry medals, 335 the gallantry certificates of the Supreme Commander, 2,605 the gallantry certificates of the Commander-in-Chief of Defence Services, two the honorary certificates of the Supreme Commander and 1,087 the honorary certificates of the Commander-in-Chief of Defence Services till January 2018.